Healthy living is a daily struggle in this fast pace, on-demand world. It requires dedication, commitment and time. But who has that? 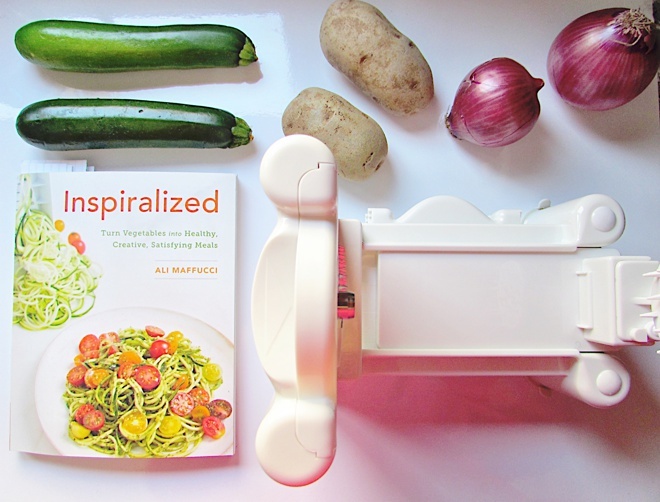 Of course, I love gadgets that help save valuable time in food preparation so when I discovered Ali Maffucci’s artful food blog Inspiralized, which shares clever recipes for turning vegetables into noodles, I jumped head first to explore. My first adventure in the kitchen started with a delicious brunch using the Inspiralized cookbook and spiral vegetable slicer. Shifting away from the original recipes slightly, I whipped up a fresh zucchini salad and baked breakfast buns. Here’s how I made two of our favorites the Inpiralized way. Happy Brunching! Thoroughly wash the zucchinis (you can use half a lemon to rub throughout the skin while rinsing), pat dry when finish then use the vegetable slicer to create thick noodles. Set it aside in a large bowl. In a small bowl make the dressing by whisking together vinegar, olive oil, lemon juice, oregano, basil, salt, and pepper. 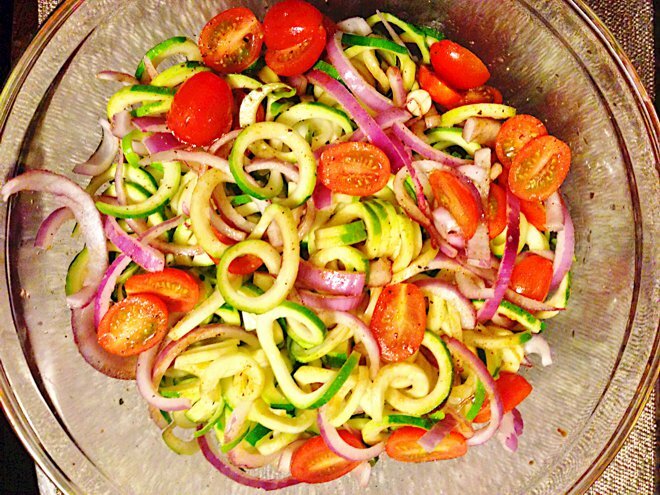 Pour the dressing over the zucchini spirals, tomatoes, red onions, feta cheese then toss to combine. Refrigerate at least 30 minutes before serving chilled. Wash, peel, then place potatoes through the spiral vegetable slicer using the blade to create thin strings that are then grilled in a pan until golden. Set aside to cool. In a large bowl mix together the eggs, milk, onions with salt and peppercorn. 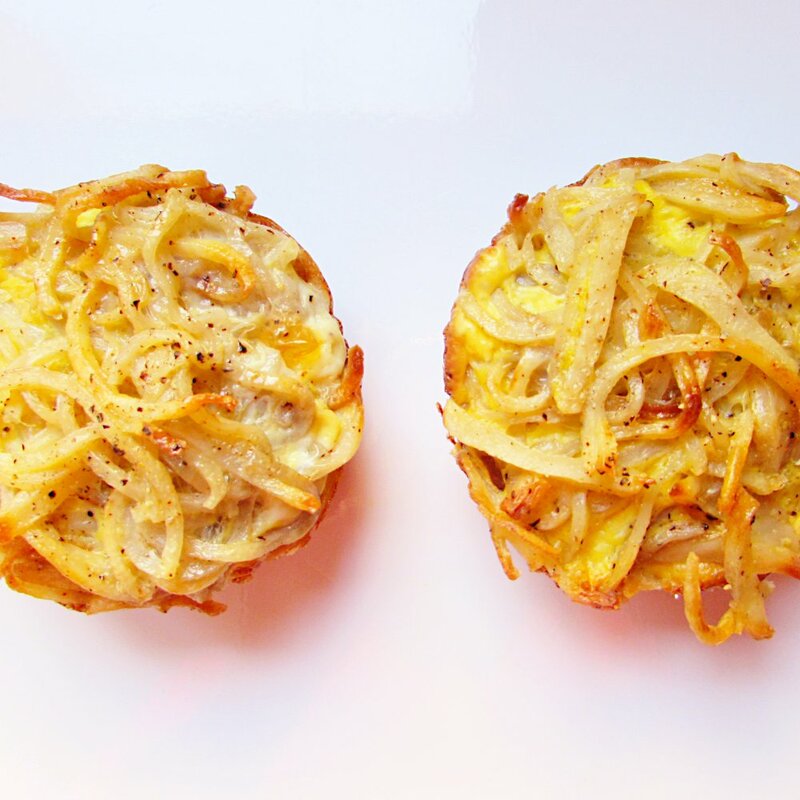 Spray non-stick oil into each muffin tin and fill with potato spirals. Pour egg mixture into each of the muffin tins then bake at 375 degrees Fahrenheit for 20-30 minutes or until cooked through and golden.